Did you ever go to a play, or movie, or watch a television show, with little expectations? You do not hope for much and, about halfway through the production you sit up and your eyes widen? Your blood races a bit? The show, that you thought so little about, turned out to be really superb, something special? That’s what happened to me on Sunday when I went to see Nureyev’s Eyes, a play by David Rush, in New Brunswick, N.J. The play, that opened last weekend at the George Street Playhouse there, is wonderful. It is the story of how a New York area painter, Jamie Wyeth, son of the famous artist Andrew Wyeth, met with superstar Russian dancer Rudolf Nureyev at different times over the course of five years to complete several paintings and hundreds of sketches of the ballet legend. It is a play, too, about how two very different men from different continents and diverse backgrounds became friends. Nureyev’s Eyes is a fine history play, too, and you learn much about Soviet-American hostilities in the Cold War years of the 1960s and 1970s and about how Nureyev defected and worried all of his life that the Soviet secret police, the KGB, would capture him and drag him back to Russia. Bill Dawes, as Nureyev, is electrifying and commands your attention as soon as he struts on to the stage, his muscular, lithe body straining at his clothes. Dawes has a perfect Russian accent and, as the moody, cocky, self-absorbed Nureyev, worries about everything. The only thing he does not fret about are his dancing skills. He never really talks about them at all because, as anyone, and especially Rudi himself, would tell you, he was the best, a superman in tights. Director Michael Mastro has done a fine job of letting Dawes, as the dancer, and William Connell, as painter Wyeth, interact with each other, sometimes embracing and sometimes arguing. The two gifted actors carve out a fine play. Nothing really happens in the drama, but, even so, you are drawn deep into the personalities of the two men. Wyeth fights to move out of the image of his famous father and establish his own identity in the art world and fights even harder to rein in the impetuous, bombastic Rudi, his most famous subject. Nureyev, it seems, despite his triumphs on stage all over the world has one single goal – to be named ballet master of the New York City Ballet. He never explains why, but feels it will not happen because Lincoln Kirstein, head of the ballet, apparently does not like him. Rudi fumes. The two men rumble throughout the play and finally, smoke coming out of his ears, Rudi denounces the full portrait that Wyeth finished of him. He does not want it shown in public but the painter demands that Rudi let him make it the centerpiece of his new art show. The artistic titans engage in a bitter dispute over it. Rudi tells him that he just hates the portrait. Or does he? 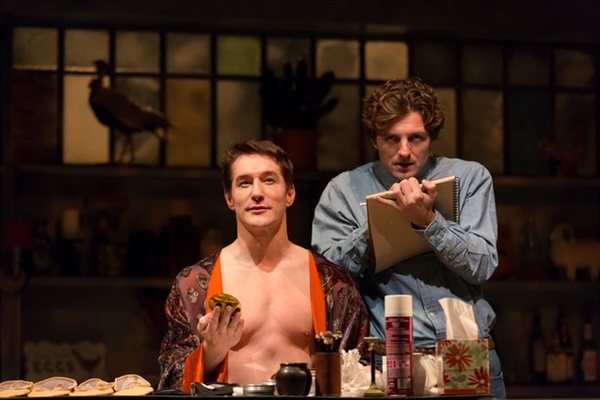 What makes the play so good is playwright Rush’s creation of Nureyev. The dancer had a reputation as a quick tempered, egomaniacal giant of the dance world and a man who socialized easily with celebrities and the rich and famous. Rush captures that well. You want the dancer to succeed, and applaud the success he has had, yet you fear that his angry demeanor will wreck things for him. You want the painter to succeed, too, and understand, about halfway through the play, that he seems to be making Rudi’s portrait the centerpiece of his life. Or is he? Nureyev tells Wyeth that he has everything in life – talent, a job, home and a loving wife. The dancer has none of that. All he has is fame and fans; he is a legend, nothing more. Nureyev’s Eyes is a loving portrait of a great star and a riveting story. You learn much about dance and about Russian history. Perhaps nothing symbolized the brute, authoritarian ways of the Soviet government like its view of its worldwide renowned artists and sports stars, from writer Boris Pasternak (Doctor Zhivago), to Nureyev to its hockey and gymnastic stars. Rush puts a lot of that in his play and it serves as a nice backdrop for the politics and cultural life of the Soviet Union in the Cold War. Nureyev, born in 1938, bloomed as a dancer while still a teenager in a Kirov Ballet school. He was soon promoted to the ballet company itself and became a national figure. In that era, male dancers served mostly as someone for the female stars to lean on, but not Nureyev. The charismatic dancer single-handedly changed the role of the male dancer from lamppost to superstar and turned the dance world upside down. He toured Europe with the Kirov in 1961 and earned sensational reviews everywhere. He defected in Paris that year, a highly publicized event, and then flew to London, where he joined the Royal Ballet and became even more famous as the dance partner of its superstar, Margot Fonteyn. Rudi danced in the U.S. numerous times and played roles in various films, documentaries and television series. He was credited with making The Muppet Show a hit when he starred as a dancer on one episode and performed a delightful tap dance with Miss Piggy. Tragically, Nureyev died of AIDS at just 54 in 1993. The world lost a superstar, but this play brings him back, if only for an evening. It is an evening well spent, however, and a look at one of the greatest dancers who ever lived. PRODUCTION: The play is produced in association with the Delaware Theater Company. Scenic Design: Lexis Distler, Costumes: Esther Arroyo, Lighting: Christopher J. Bailey, Sound/Music: Scott Killian, Choreography: Charlie Williams, Dialect Coach: Stephen Gabis. The play is directed by Michael Mastro. It runs through February 21.